These are complete single tank BCDs with hydro-dynamic doughnut style air cells. They have a narrow frontal profile to really improve streamlining in the water when in swimming position. 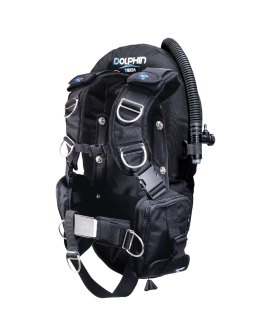 The minimalistic harness also give more chest room for easier access to attachments and better manoeuvrability underwater. The maximum size of scuba cylinder can be used is a single 15L (95cft) . These complete 65lbf double bladder twin tank BCDs, with JT-65 horseshoe style air cell and BP3H twin-tank band sets come in two variations, Basic harness and Deluxe comfort harness (HB-2) system standard with anatomically cut shoulder pads and waist cushions. Used in conjunction with the JT-65. These are complete twin tank BCDs with hydro-dynamic doughnut style air cells. They have a narrow frontal profile to really improve streamlining in the water when in swimming position. 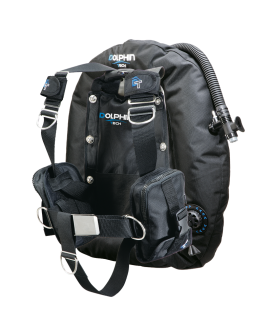 The minimalistic harness also give more chest room for easier access to attachments and better manoeuvrability underwater. The maximum size of scuba cylinder can be used is a single 15L (95cft) . 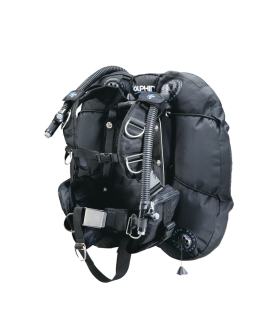 Identical to the HHBP I, this commercial diving bell harness features crotch straps, highly desirable in a technical diving harness rig. 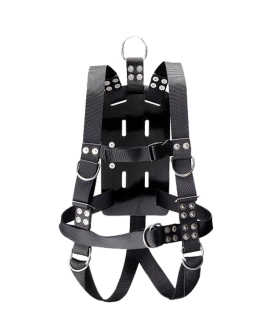 Crotch straps on the HHBP II ensure there is no unwanted vertical or horizontal movement – significant weight is stabilized – your equipment moves when you do. Crotch straps will also be very beneficial if you are scootering. Rear D-ring: 8mm rear upper D-ring for emergency lifting of diver.